For fresh ideas on how to use that beautiful UBC Farm produce you picked up from our Market, check out the Veggie-of-the-Week blog post series! Crafted by a team of UBC students in the Faculty of Land and Food Systems as part of their Community-Based Research project with Friends of the Farm, these posts contain neat info on folklore, nutrition and recipes corresponding to some of the produce items currently available at the UBC Farm. This week, basil! Basil is a well-loved seasoning in many different cultural cuisines. From Italian pasta to Taiwanese-style fried chicken, basil plays an important role. Its potent, slightly spicy fragrance lends a sophisticated taste to many dishes. In Italy and Romania, basil is regarded as a symbol of love. 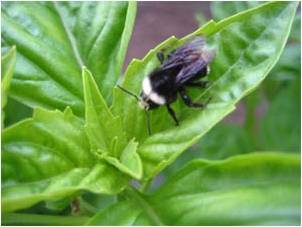 Basil comes from the same plant family as peppermint. It has round but pointed leaves that are usually green in color, although there are also red- and purple-leaved types among the 60 varieties out there, each with somewhat different appearances and tastes. Stemming from the historical conviction of Greeks and Romans that pungent basil could only be grown if a gardener cursed and ranted while sowing the seeds, the French expression “semer le basilic” (sowing basil) means to rave. Choose fresh basil over the dried form of the herb when possible since it is superior in both flavor and quality. The leaves of fresh basil should be deep green in color and without any dark or yellow spots. When purchasing dried basil, try to select organically grown basil since this will give you more assurance that it has not been irradiated. Irradiating basil can lead to a significant decrease in its vitamin C and carotenoid content. Fresh basil should be stored in the refrigerator wrapped in a slightly damp paper towel. It may also be frozen in an airtight container. Dried basil should be kept in an airtight container, where it will remain fresh for about six months. For best results, add basil near the end of the cooking to ensure that its flavor is not lost through too much heat. Basil is an excellent source of vitamin K. Basil is also rich in iron, calcium and vitamin A. In addition, basil provides abundant dietary fiber, manganese, magnesium, vitamin C and potassium. As a result, basil plays a vital role in the healthy functioning of blood, bones and eyes. It also promotes cardiovascular health and is a good source of antioxidants. Place the basil in a blender. Pour in about 1 tablespoon of the oil, and blend basil into a paste. Gradually add pine nuts, Brazil nuts, Parmesan cheese, garlic, chili powder, and remaining oil. Continue to blend until smooth. Serve on pasta, gnocchi, pizza, or appetizers. Divide the tomato mixture evenly over the baguette slices. Top the slices with mozzarella cheese, is using. The Future of the Farm and the “Future Housing Reserve” – what’s next? On the surface, much progress appears to have been made in “saving” the UBC Farm. UBC President Stephen Toope has repeatedly expressed his recognition of the vital role that the Farm plays in making UBC a leader in sustainability, and the South Campus Academic Plan, “Cultivating Place,” has received strong endorsement from UBC’s Executive. Such breakthroughs are due in no small part to an outpouring of public support for the Farm over the past 18 months, which included over 2000 students, staff and community members celebrating this 24-hectare farm-forest agroecosystem in April 2009’s Great Farm Trek. Cultivating Place outlines a progressive vision for South Campus in teaching, learning and research on pressing issues of food system sustainability, and we need to know how the principles of this academic plan will be followed under UBC’s new Land Use Plan. This is a critical time to voice your support for the Farm: Please sign up for one of the two Open House workshops on THURSDAY, JULY 15 (4:30-6pm, or 6:30-8pm) by RSVPing to Stefani Lu: stefani.lu@ubc.ca Thank you in advance for coming!